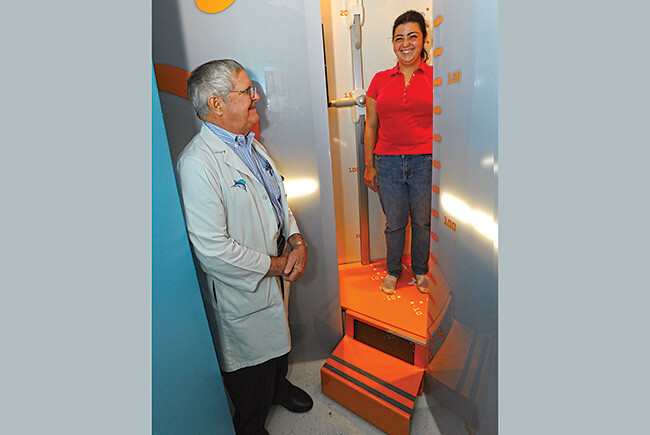 Dr. Shufflebarger with patient in EOS imaging machine. Dr. Harry Shufflebarger, award-winning surgeon and practitioner, brings 40 years of experience and proven procedures to every child's care. 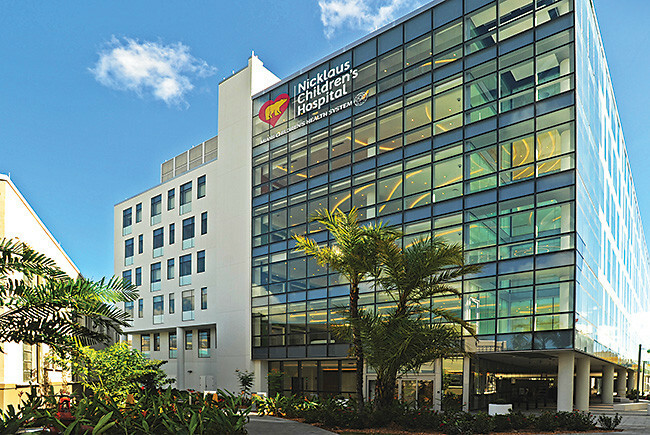 Nicklaus Children’s Hospital provides diagnosis and treatment of spinal disorders in children and teens. The Division of Spinal Surgery at Nicklaus Children’s is one of the nation’s leading providers of treatment for children with spinal conditions such as scoliosis. The division has been providing treatment for more than 35 years and has been instrumental in development of corrective surgical procedures for spine conditions now in use throughout the world. “We built a high-level, high-functioning spine surgery program 25 years ago and have been able to maintain it,” says Dr. Harry Shufflebarger, director of the Center for Spinal Disorders and a veteran of 40 years with Nicklaus. The Center has established itself as one of the most experienced and successful in the nation in treating spine disorders in children. 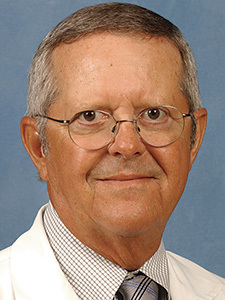 In fact, Dr. Shufflebarger was instrumental in developing surgical spine treatments now in use around the world and contributes extensively to clinical research that continues the advancement of treatment practices. Best practice guidelines developed by Dr. Shufflebarger have significantly decreased length of hospital stay after scoliosis surgery. Bracing is the mainstay of non-surgical scoliosis treatment. It is usually indicated for children whose curves are less than 40 degrees by measurement, assuming some growth still lies ahead. The goal of bracing is the prevention of curve progression; it doesn’t correct it. The Center sees children from newborns up to their early 20s, but the most common patient is in the adolescent group — ages 12 to 16. There are a number of different causes of scoliosis, such as scoliosis associated with vertebral malformations, which is congenital. Children with genetic scoliosis are not born with it, but they have the gene make-up to develop it later, similar to the onset of diabetes. And finally, there are children who have neuro-muscular problems such as cerebral palsy and muscular dystrophy, and they can also develop scoliosis. As an innovator in spinal deformity care and a globally renowned expert in the treatment of pediatric spinal conditions, Dr. Shufflebarger has been honored for his contributions in the area of spinal instrumentation and unparalleled commitment to his patients and the medical community. His recent awards include being the recipient of the 2016 Lifetime Achievement Award from the Scoliosis Research Society. The Center offers a team approach to care that has been established as a model of practice within the spinal surgical field. The team includes the board-certified orthopedic surgeons who perform spinal surgery in children, dedicated spine-trained anesthesiologists and a MD neurologist who monitors the spinal cord and nerve function throughout surgery. Dedicated spinal surgical nurses, technicians and radiology technicians complete the team. The surgical nurses are experts in the care of spinal surgery patients, managing six to eight patients per week. The majority of surgical scoliosis cases at Nicklaus take between three and four hours to complete. In addition, Child Life Specialists work with children and families upon admission to help with questions before and after surgery. “We have a pretty standard recovery protocol,” Dr. Shufflebarger says. “We don’t use intensive care for post-operative patients. We use a regular medical surgical floor. Our floor nurses are familiar with the post-op course and can pick up on anything that’s out of the ordinary, if that happens, and report it to us. They do a great job. For children that have been in braces, scoliosis surgery gets them out of the brace. “There’s usually been a visual deformity associated with this,” Dr. Shufflebarger says, “and that’s pretty well gone. They’re very happy about their shape and they are assured that their scoliosis is controlled or fixed and that there’s no risk of it getting worse.